The Woods Creek neighborhood of landowners has been actively working with the Watershed Council since 2006 to improve their watershed. Restoration started with addressing seven fish passage barriers that were removed and replaced with “Fish Friendly” crossings. Neighbors and student volunteers became involved in observing how fish responded to the changes by checking fish traps with Oregon Dept of Fish & Wildlife and the Watershed Council and all stream side landowners cooperated to locate and treat invasive Japanese knotweed. Woods Creek is clearly some of the best habitat available to salmonids in the Marys River Watershed. With headwater flows and gravel resources emanating from Marys Peak and with a generally intact riparian, Woods Creek has the potential to provide quality habitat to sustain a healthy population of cutthroat trout and steelhead. In 2008, a Rapid BioAssessment and snorkel inventory was completed that helped to understand how fish were using the habitat and what was most limiting fish habitat and overall function on Woods Creek. Woods Cr Rapid BioAssessment 2008 With fish passage addressed, it became apparent that winter habitat was lacking. Cutthroat trout would have difficulty sustaining in the strong winter flows in Woods Creek without places to find refuge in slower water out of the main channel. Lack of woody debris in the stream channel kept the creek confined and pumping its gravel and sediment resources downstream, leading to exposed bedrock on the stream bottom. Woods Creek is a destination for salmonids in Marys River who migrate upstream in the summer looking for cool water. Stream temperatures in the lower reaches of Woods Creek however were limiting this attraction. Bedrock and the lack of subsurface flows through the gravels exposed the stream to solar warming, making it less attractive to fish moving up out of mainstem Marys River. In the summer of 2008, two landowners volunteered to install large wood to create eight log jams and to reconnect an historic side channel alcove on their floodplain terrace. In addition, 800 native trees were planted on these and two other sites. A neighborhood meeting to visit and discuss these projects led to additional voluntary participation. In 2009-10, with the cooperation of nine Woods Creek landowners, nineteen more log structures were installed, five alcoves were constructed, and 420 riparian trees were planted. A small pond that was spilling warm surface water directly into the stream was retrofitted to draw the overflow from the cold water at the bottom of the pond. 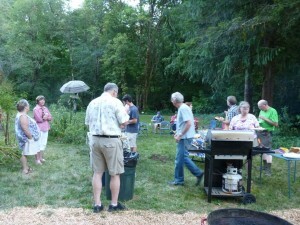 The neighborhood began to meet on an annual basis, hosted by the Zielinski’s, to discuss and celebrate the restoration work. Neighbors began to ask the question of when they could work on the lower Woods Creek section. This led to the most recent work with ten landowners in lower Woods Creek to construct eight boulder weirs and six log structures to accumulate gravels over exposed bedrock and take advantage of low floodplain terraces for additional winter habitat. 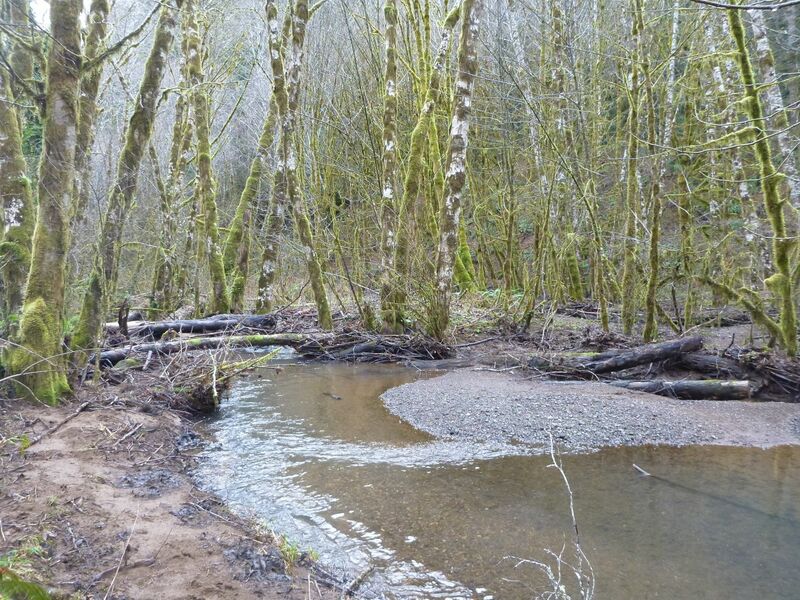 To date, all 42 landowners have participated in stream surveys and 35 landowners have voluntarily worked with the Council on stream enhancement projects for Woods Creek.